Promoting art in public spaces in downtown Salem and the Salem Convention Center since 2008. 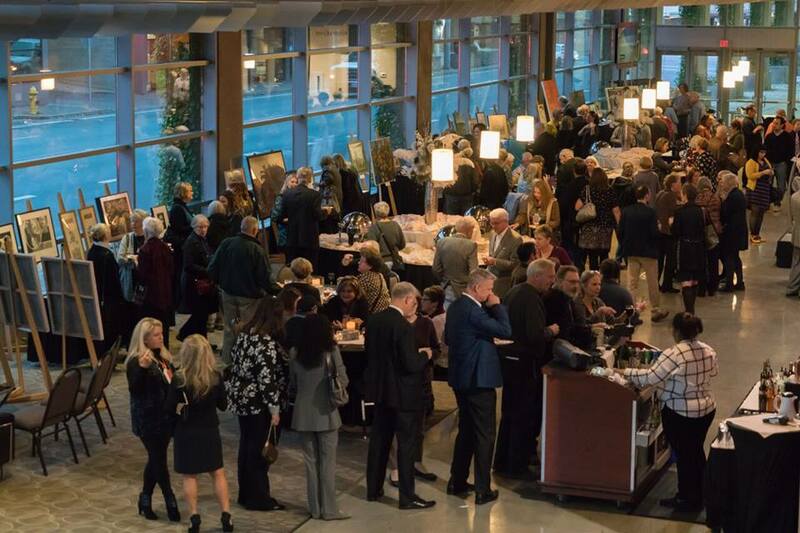 The first annual awards Celebrating the Arts in Salem were a highlight of the Oregon Artists Series Foundation’s “Fall for Art” fundraiser in November, 2016 at the Salem Convention Center. Guests bid on more than 30 pieces of “twice loved” art in a silent auction and honored two Salem artists, two arts supporters and an arts activist and institution. This was the second annual fundraiser for the foundation, created in 2008 to foster the exhibition of art in public spaces in Salem. The 2016 honorees included artists Rob Bibler and Susan Trueblood Stuart, both mainstays of Salem’s community of artists; John Olbrantz and the Hallie Ford Museum of Art at Willamette; and arts patrons Joan and Garth Brandow. Bibler, known for drawings and paintings exploring contemplation and investigation, launched the art program at Chemeketa Community College, where he taught for 30 years in drawing, painting, printmaking and film studies. He also created the Wednesday Evening Film Series at the Historic Elsinore Theatre. Stuart, who studied at Willamette University and the University of Oregon, is known for her vigorous and colorful paintings of the Northwest landscape. She also has been an educator and activist for the arts, serving on the board of Salem Art Association for seven years. John Olbrantz and the Hallie Ford Museum of Art at Willamette University have created programs that bring cultural tourists to Salem. Olbrantz is the Maribeth Collins director of the museum and currently chair of the Salem Public Art Commission. The Hallie Ford Museum of Art has been a partner with the foundation, sharing works from the museum collection for exhibitions at the Salem Convention Center. Joan and Garth Brandaw were honored as arts supporters for their investments in the arts. Garth Brandaw is best known as a senior principal and founder of CBTwo Architects of Salem. His design and project management experience dates back to 1985 with more than 250 projects throughout the U.S. and Canada, including WaterPlace and Salmon Run in Salem. Joan and Garth Brandaw have made a major commitment to expand the foundation’s program to place sculpture in downtown Salem.